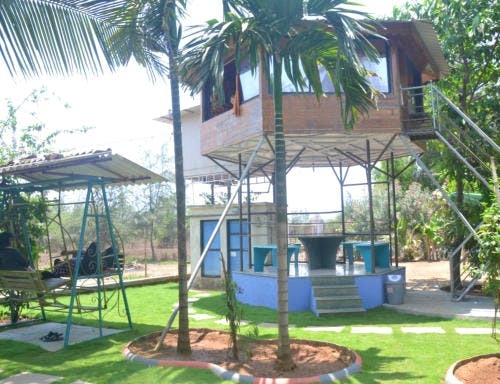 If you are looking to spend the weekend amidst lush greenery, good hospitality, and a beach, head to Kulpe Farm House in Alibaug. You just need to give them a call a day prior to your arrival and they'll make the required arrangements. They have decent double-bed rooms and will provide an extra bed in case you need to fit in an extra person. When there, don't miss out on the breakfast they provide. Their upma and omelette pav are a must try. In case you're new to the place, they'll even guide you with the places around to visit. Kashid beach and Murud Janjira are not very far from the farmhouse. But if you're not in the mood to hit the roads, you can head out for a breezy stroll along the beach right outside the back gate of the farmhouse. If that also does not interest you, they have hammocks, swings, and beautiful seating arrangements made amidst lush flora and fauna. They also have chicken and pigeons on the farm. You can spend an entire day just lazing around and relaxing like a boss. So we're saying, take that next trip to this place to soak up the goodness of nature and to feel rejuvenated. The washrooms could be better.